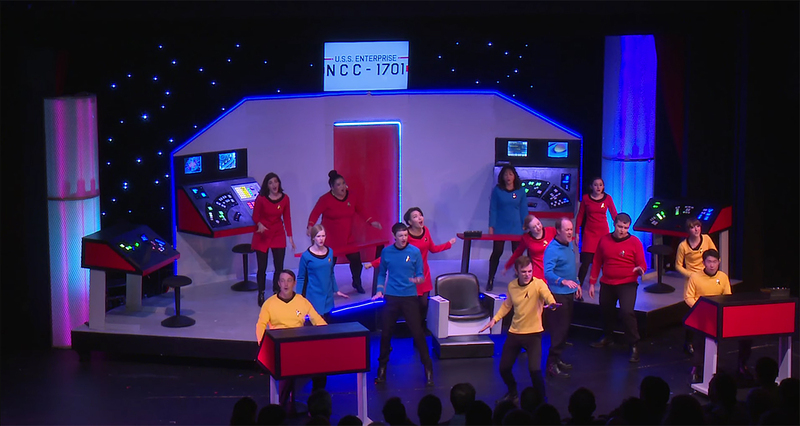 You don’t have to be a theoretical physicist to write a Star Trek musical…but it sure helps! The musical is set in the prime TOS timeline with Kirk, Spock, Bones, and the rest of the original crew. There’s Klingons, Andorians, and all the wink-wink references to that Star Trek trivia you know and love—from Khan Noonian Singh and Sulu’s love of botany to Elaan of Troyius and the Space Hippies…and even a poke at the Kelvin-verse timelime! There’s also satirical chuckles to many of the tropes of musical theater, with 19 different song and dance numbers ranging in style from Andrew Lloyd Webber and Gilbert & Sullivan to doo-wop, gospel, tango, and even Motley Crüe (and don’t blink or you’ll miss a quick nod to West Side Story). Now, if you’re expecting to see something on par with the likes of Hamilton or Les Miserables, I need to mention that this cast is made up of students, faculty, and alumni from the California Institute of Technology plus scientists and engineers who usually build interplanetary space probes for NASA’s Jet Propulsion Laboratory! In other words, set your phaser expectations to “This is musical theater, not rocket science—and these are rocket scientists.” But really, when you think about it, who better to put on the world’s first-ever full-length live Star Trek musical?! Our saga begins in the state of Minnesota, with two brothers who grew up there, GRANT and COLE REMMEN. In the summer of 2013, Grant was preparing to enter a graduate degree program at Caltech, a top-level university known for a vigorous curriculum that accepts less than 10% of applicants. Grant would be studying theoretical physics, researching various problems in quantum gravity and cosmology (betcha didn’t even know that quantum gravity and cosmology had problems!). His younger brother Cole was about to begin an undergraduate theater arts program at the University of Minnesota. Cole had already been acting in productions since the age of five, and later in college, Cole would go on to both act in and direct numerous stage productions. 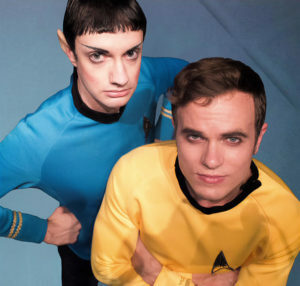 And so the two brothers decided to write a Star Trek musical together…and I know what you’re thinking! One brother was a theater arts major with extensive stage acting experience and the other was a theoretical physicist researching various problems in quantum gravity and cosmology. We all know who really wrote this musical, don’t we? Both brothers had grown up receiving piano, voice, and instrumental lessons of various types. Older brother Grant (the physicist) played trumpet with a volunteer community band and sang tenor with the University of Minnesota Gospel Choir. He was also involved in numerous high school theatrical productions. They began work in September of 2013, just as the two brothers went off to their respective schools, separated by 2,000 miles. Cole commented , “We worked on the show over any breaks we had, Skyped a lot, and sent drafts back and forth. It was a long but fun process.” Granted added, “Both Cole and I worked collaboratively on the script, music and lyrics. We story-boarded the overall plot to figure out how to fit in songs to further the story and develop characters….Cole definitely wrote more of the music and I wrote more of the lyrics, but we both worked significantly on all aspects.” Their goal was to have something ready to perform in time for the 50th anniversary of Star Trek in 2016. 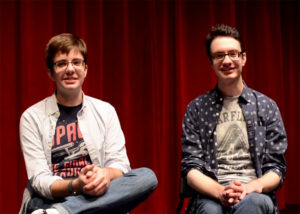 Over the next year and a half, they duo wrote 19 songs and created a complete script for a full-length musical. They included nearly all of the original iconic crew members of original Enterprise (except Rand, but Chapel is in there) plus nearly a dozen original characters and a chorus of unnamed red shirts and random crew. By January of 2015, the script was ready for a workshop at the University of Minnesota, and the following month, a public reading there received a very enthusiastic response. By May, the script was ready for a table read-through and sing-through at Caltech…and that’s where the musical hit warp speed. The theater was packed with 180 people who laughed at all the right places and gave the table read a standing ovation! One of those attendees was BRIAN BROPHY, a faculty member in Caltech’s Performing and Visual Arts department (yes, Caltech has one of those! ), and afterward, he approached the brothers about directing their musical as a full theatrical production for Theater Arts at Caltech (TACIT). Brian was actually no stranger to Star Trek, having guest starred in the second season Next Generation episode “The Measure of a Man” as Commander Bruce Maddox. As you can see, these folks weren’t messing around! They took this performance VERY seriously. Holly herself is a NASA optical engineer at the Jet Propulsion Laboratory, spending her days working with cutting-edge imaging spectrometers. But she also sings for the Verdugo Swing Society and JPL’s Jazz Propulsion Band. Other JPLers in the production included DAVID COREN (Chekov), an engineer who is currently working on a space probe that will be traveling to Jupiter’s moon Europa looking for signs of life in its underground oceans; DAVID SEAL (Klingon Voghos), who plans new missions at JPL; and ERIC FERGUSON (who played piano in the pit band), who is a mission operations engineer. Many in the cast were full-time students at Caltech with demanding academic workloads during the months leading up to the six live performances. MICHAEL WONG, in addition to playing Sulu, was simultaneously a graduate student in planetary science and an applicant for NASA’s astronaut program! KEVIN BATES, who played Kirk (a huge role with ample lines and multiple songs, including a solo and an emotional duet with Spock) was a fourth-year grad student studying chemistry at the time. For many in the cast, this was their first experience acting (and singing) on stage! One notable exception was co-author Cole Remmen, the younger playwriting brother at the University of Minnesota. Director Brian Brophy asked Cole if he would participate as both assistant director and also play Spock in the production. Although still a full-time student at the University of Minnesota, Cole took a semester of independent research credits to be able to temporarily relocate to Caltech in Pasadena. At first, the cast rehearsed only on weekends. Then they expanded to twice a week. And in the final month, they cast was rehearsing nearly every day! You can do a deeper-dive into the making of this complex production through a series of a dozen 1-to-5 minute behind-the-scenes shorts created by the director and two of the cast members (and you can find them by clicking here). They’re fun, funny, and fascinating! VOYAGER’s Robert Picardo makes an unexpected on-stage cameo. The cast a crew got a special treat when Star Trek: Voyager actor ROBERT PICARDO (the holographic Doctor) came for a visit. 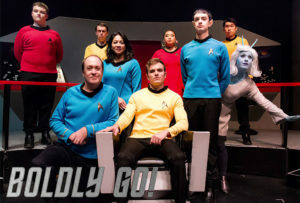 He was shooting the second episode of his vlog series “The Planetary Post with Robert Picardo” (you should check it out; Bob is very funny and informative), and was doing a feature on this new Star Trek musical. 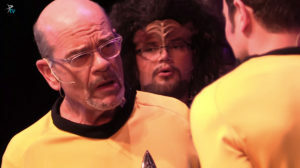 Naturally, they invited the accomplished actor on stage for a cameo, and for one of the six performances, the role of Admiral Barnett was played by Robert Picardo himself! At its core, “Boldly Go!” is a story about being true to oneself and one’s convictions, about friendship and love, about discovery and wonder, about the triumph of the individual over adversity, and about the joy of sharing with each other this vast and mysterious Universe. But really, for me, it was just good Trekkie fun. Sure, some of the cast sang like scientists and danced like engineers. But everyone gave it their all, and some of the performances were quite spectacular (or Spocktacular). And anyone who has ever been involved in staging live musicals, be it high school performances (like me), small-town community theater, or even huge Broadway productions will appreciate the time, work, and effort that went into tackling and pulling off such an ambitious production. There’s also a touching duet between Kirk and Spock at the end that’ll have you tearing up (unless you’re an emotionally repressed Vulcan! ), but I’m not gonna give you the time-code on that because it’s a huge spoiler. If you want to see it, just watch the whole thing…even if it takes you a few sittings (like it did me) to get through it all. Believe me, it’s totally worth it! And now, ladies and gentlemen, I give you…BOLDLY GO! That was excellent!!! I would have had Christine Chapel & Carol Marcus wear blond wigs. These characters did have blond hair. Nothing says “Christine Chapel” more than a short blond wig in a Sixties hairstyle. It would never occur to CBS/Paramount/other copyright holder of STAR TREK to do a STAR TREK musical in a trillion years. This was totally excellent! I waited until I had a chance to watch the entire video before commenting. Outside of a couple of clunky plot moments, it was great and the acting much better than I expected from your write-up. In this era of repeating formula from the past ad nausium, the plot itself was original and a breath of fresh air. Next Next post: THE ROMULAN WARS releases PART 1 of their FINAL EPISODE!